YUGOSLAV NEOAVANGARD JOURNALS 1960 – 1990. The exhibition YUGOSLAV NEOAVANGARD JOURNALISTS from 1960 – 1990 will open on Monday, March 21st at 7 pm at the Pro3or Gallery. The exhibition presents a historical and design overview of artistic journals created on the territory of the former Yugoslavia in the period from the 60s to the early 90s. It analyzes the context in which they created the authors and the group behind them, as well as their interconnections at the local and international level. The curator of the exhibition is Ana Radovanovic, and the project originated from the master work of this author in Italian University, ISIA Urbino. As part of the project and exhibition, a total of 28 magazines were processed, which can classify in the context of neo-avant-garde art. Neo-avantgarde art magazine is, among other things, a unique periodic publishing product of conceptual artists. Unlike many Western examples, whose authors had intentions of full production, the local people were not tied to the market, and most often for official art institutions. They represent an independent, self-published publication, often a small circulation that has distributed in artistic circles. As alternative meeting places, places for debates and exhibition of works by artists, the Yugoslav neo-avant-garde art magazine, is an equal member of any other form of artistic expression of that time. The phenomenon that the exhibition examines dates back to the 1960s, with the appearance of the Gorgon Anti-Magazine (1961), as a prototype of an artist journal, whose definition will appear officially in the ’70s. The project focuses on magazines that appeared on the Yugoslavian soil from 1960 to 1990. The following magazines include: Address, Akcent, Breza, Bit International, Gallery 212, Gorgona, Edition A, Catalog 142, Contactor, LHOOQ, May75, Mental, Mixed Up, Underground, Moment Newsletter, Neuro Art, Newspaper Gallery SC, Pesmos, PN, Postgorgona, First Number, PS Gorgona, Rok, Second Manifesto, Signal, TOtal, Underground, Elevator, WestEast, and Wow. 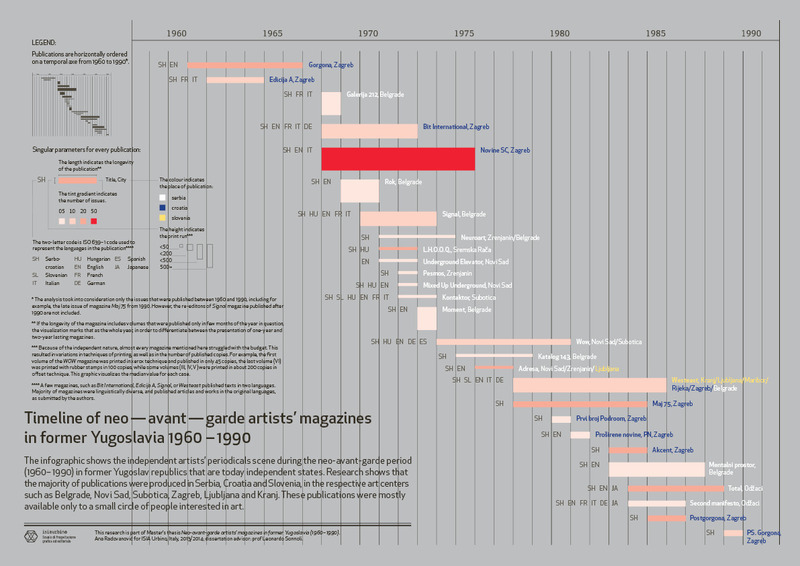 The setting of an exhibition includes a series of infographics that explain the relationships and relationships between the various journals, the artists they were driving, and the contexts in which such practices were taking place; Detailed chronology and reputable (original) copies of the magazine and their reprint. The project also talks about links between centers such as Belgrade, Ljubljana, and Zagreb, with the addition of some Vojvodina centers, such as Novi Sad and Subotica. Ana Radovanović (1986) is a graphic designer from Belgrade. She completed her undergraduate studies of painting in Rome at the Academy of Fine Arts (Accademia di Belle Arti di Roma), followed by a Master of Graphic Design and Communication at the Italian University ISIA Urbino. She has exhibited in more than 20 groups and 3 solo exhibitions in Serbia, Croatia, Slovenia, Italy, Belgium, and Canada. She has won two international awards (Golden Bra- Best Design, Magdalena, Maribor, Slovenia, First Prize, Day D, and Zagreb, Croatia). He works in the field of journalism and history design, and also as a freelance graphic designer. She is a regular contributor to the Croation portal Vizkultura. hr, and she is executive editor of Designed.rs. The research project on neo-avant-garde artist journals in the former Yugoslavia awarded with the first prize of the DAn D festival in Zagreb in 2015. After Dana D, a solo exhibition held in the HDD Gallery- Coration Design Society. In addition to Zagreb, work has shown at numerous international exhibitions and conferences in Split, Ravenna (Italy), Green Bay (Wisconsin, USA), as well as within the Kamenzind publications (Belgrade,2016) and The Territories of Artists’ Periodicals (Paris, 2015). The setting in Belgrade is part of the 5th International Conference program (Graphic) Designer: Author or Universal Soldier Connection, March 2017. The project originated from the master’s degree at the ISIA Urbino University, Italy, mentor prof. Leonardo Sonnoli.